At least 47 organizations affiliated with the Russian Orthodox Church (ROC) have been awarded presidential grants totalling 55.3 million rubles [approx. 734,000 euros] in the latest NGO grants competition, according to the Presidential Grants for Civil Society Development Foundation website. They include lay religious organizations, monasteries, parishes, and dioceses. Thus, the parish of the Church of the New Russian Martyrs and Confessors in Smolensk has been awarded 2.2 million rubles for a project entitled “The Pearl Necklace of Holy Russia,” meant to encourage youth tourism and cooperation with the Belarusian Orthodox Church. The ROC’s Yakutia Diocese has been awarded 2.5 million rubles for a project entitled “Yakutia’s Churches Are Russia’s Historic Legacy.” The grant winners plan to produce three documentary films, ten videos in a series entitled “Reading the Gospel Together,” and one video about Easter. The largest grant awarded to these NGOS was 10 million rubles. Mercy, an ROC organization that helps homeless people, won this grant. According to Ilya Chukalin, executive director of the Presidential Grants for Civil Society Development Foundation, it is easy to explain why organizations associated with the ROC have won grants. The Orthodox Initiative Grant Competition has been held in Russia since 2005, so these NGOs have know-how in writing grants and also submit numerous grant applications. As Chukalin explains, the more applications submitted, the better the chances of winning. “Besides, the grant applications are mainly submitted by church parishes, often in villages. Grants have to be submitted by legal entities, and there are only two types of legal entities in small villages: local governments and church parishes. Usually, they apply for small grants—for example, to build a park or sports facilities in the village,” Chukalin said. Chukalin, however, underscored the fact that Muslim and Jewish projects have also been awarded grants. Grants totalling 41 million rubles [appox. 554,000 euros] were awarded to eleven branches of the Combat Brotherhood, headed by Boris Gromov, former governor of Moscow Region, and Russian MP Dmitry Sablin. The Combat Brotherhood’s head office won the largest grant, worth approximately 20 million rubles, for a project entitled “Memory Is Stronger than Time,” dedicated to the thirtieth anniversary of the withdrawal of Soviet troops from Afghanistan. The Russian Union of Youth (RSM) has been awarded 63.5 million rubles [approx. 843,000 euros] to involve young people in developing small towns and settlements. A total of 19,000 applications was submitted to two competitions in 2018. 3,573 projects were awarded grants. The total amount awarded was 7.8 billion rubles [approx. 103.6 million euros]. Alexei Makarkin argues that this way of awarding grants has its own rational. The ROC has long been an ally of the government, which can help it implement small projects, for example, to encourage an energetic priest. The Combat Brotherhood has also been working with the government a long time, and this year marks the anniversary of the withdrawal of troops from Afghanistan. The large grant awarded to the RSM, however, may have been triggered by the protest votes cast in many small towns during the recent local and regional elections, argues Makarkin. “The hinterland is also vital, because in many small towns there is the sense of having reached the edge. There are no more budget cuts that can be made, and reforms will hit them hard. Therefore, the idea is to support local activists, whose projects do not require a lot of money,” Makarkin said. A 63-year-old resident of the village of Pokrovskoye in the Gornouralsky Urban District warned neighbors a TV news crew would be coming to cover utilities problems in the village. She now faces a court hearing, charged with holding a public event without the consent of the authorities. Due to a hot water outage in the village that had lasted two months, pensioner Irina Kutsenok turned to the news program Vesti Ural for help. When she found out a news crew would be coming to the village on August 1, she posted announcements about their visit in the entryways of residential buildings, asking villagers to come and speak to the news crew. Subsequently, the head of the village council filed a complaint against Kutsenok with the prosecutor’s office, accusing her of “organizing a public event without filing a notification in the prescribed manner,” a violation of Article 20.2 Part 2 of the Russian Federal Administrative Offenses Code. “The water was turned off on June 1. The council said it would be off for a mere two weeks, but two months had passed since then. I then contacted Vesti Ural. They had helped us last year with garbage removal. After a segment aired on their program, the council started picking up the garbage. The people at Vesti Ural said they would send a news crew on August 1, and on July 31 I posted flyers in the entryways of residential buildings saying regional reporters were coming to cover the hot water outage so residents would know about it. At the bottom of the flyer, I wrote, ‘Residents should meet outside the club.’ But the editors at Vesti Ural told me the crew would not be coming, because the council had promised them that on August 3 our hot water would be turned on,” Kutsenok told Mezhdu strok. According to Kutsenok, the flyers were taken down almost immediately, on August 1. They were replaced with leaflets claiming water pressure tests would be conducted in the village on August 3. Nevertheless, Kutsenok went to the village club on August 1 in case residents of Pokrovskoye had questions about the hot water outage. She was met there by Marina Selskaya, head of the Pokrovskoye village council, and Alla Semyonova, a member of the Gornouralsky City Duma. “They yelled at me, accusing me of holding an unauthorized meeting. Later, it transpired Selskaya had also filed charges against me with the prosecutor’s office, accusing me of organizing and holding a public event without notifying the council, of organizing protest rallies. Subsequently, the neighborhood beat cop came to my house and informed me I had to go to court. But I hadn’t made any speeches anywhere, nor had the TV reporters shown up. This means I am going to court for turning to the media, to a TV news program for help. What, now we don’t have the right to turn to the media, either, and we should be fined if we do turn to them? I just wanted to give our council a little nudge. I cannot get them to do anything about the water, preventive medical exams or metering devices for utilities. How much can a person take?” asked an outraged Kutsenok. The magistrate of Sverdlovsk Region’s Suburban District will hear the charges against Kutsenok on August 30. Article 20.2 Part 2 of the Administrative Offenses Codes stipulates a fine of up to 30,000 rubles [approx. 380 euros] or up to fifty hours of community service. UPDATE. After this article was published, the press service of the Sverdlovsk Region Prosecutor’s Office informed Mezhdu strok the charges against Kutsenok had not been filed with them, but with the police. Residents of the village of Tersa in Saratov Region’s Volsk District have sent an open letter to the president asking him to take charge of investigating road accident in which 30-year-old Alexander Lopasteysky was killed. According to the letter’s authors, the local police have tried to cover up a crime. A criminal case has not yet been opened, although the fatal accident occurred more than two months ago. Over three hundred people, every tenth resident of the village, signed the letter. The residents then held an assembly where they discussed the inaction of law enforcement agencies. The police immediately sprang into action—but not to investigate the accident. The next night, the police made the rounds of the village, threatening residents with huge fines for attending an unauthorized public event. Railroad Street has never been paved or lighted. On the side of the road stands a black metal cross, fenced off with a chain. 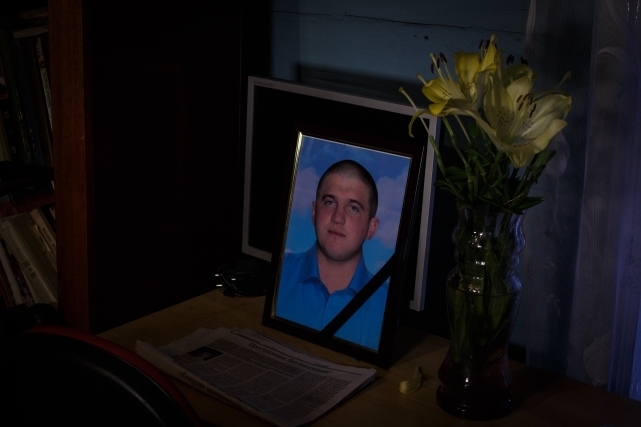 In the early hours of May 28, 2018, 30-year-old Tersa resident Alexander Lopasteysky died here while riding a motorcycle. According to his relatives, he was knocked off his bike and run over by Alexander Letov, driving a VAZ 2108 car. An investigation of the fatal road accident was not opened. Villagers claim an investigator from the district Interior Ministry office came to Tersa to question witnesses forty-two days after the accident. “The police probably thought they could dillydally, and the collective farmers would forget the whole thing,” argues Tersa resident Viktor Konstantinovich. “I can’t say the police have been paid off. They have just been negligent in this case. A man accidentally fell off a motorcycle and died through his own fault. It’s convenient. They don’t have to make any effort,” says Valentina Vasilyevna, mother of the dead man, shuffling through photos of her son. Lopasteysky’s relatives wrote to the district council and prosecutor’s office, asking them to take charge of the investigation. They received formal but meaningless replies to their requests. The only thing left to do was write the president. “To: The Kremlin, Moscow. 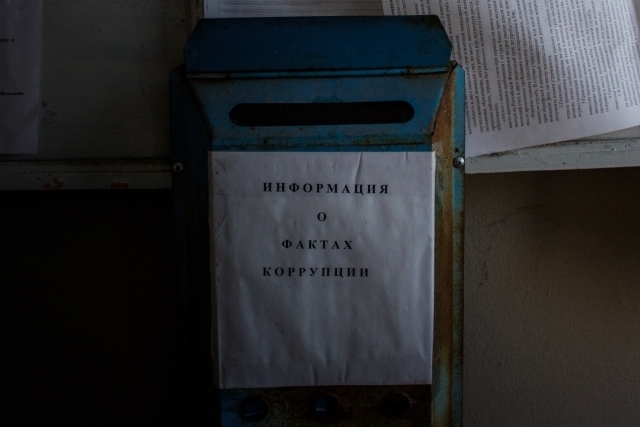 From: Your voters in the village of Tersa, Volsk District,” reads the opening of their appeal to the president, which was signed by over three hundred residents of the village, whose total population is approximately three thousand. The shop Dream is in the middle of the village, a one-storey brick box crowned with a tall wooden attic. Manufactured goods are through the door on the right, while groceries are through the door on the left. Dream’s backyard was the site of the “unauthorized public event” at nine in the evening on a Sunday. “The entire village waited for the investigation to begin. We were patient for two months. We sent letters to all the relevant authorities. What was left for us to do? People said we should raise a ruckus,” says Lyudmila Lopasteyskaya, the dead man’s sister. 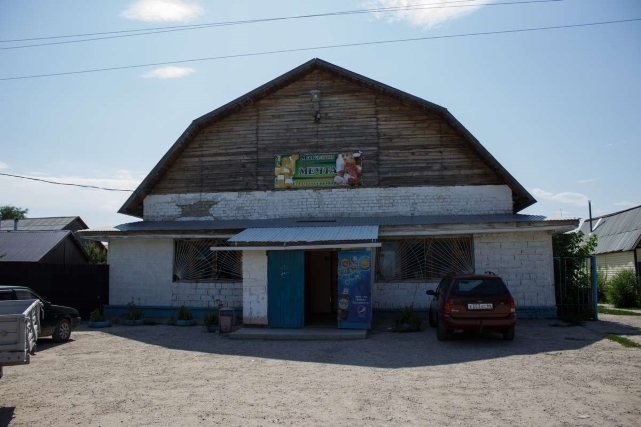 On the social media website Odnoklassniki [“Classmates”], Lyudmila asked everyone concerned about the tragedy to meet by the entrance to the village shop. Around one hundred people came. Half a dozen police officers from Volsk also came to the meeting, including one armed with a video camera. “They said it was forbidden to gather near the porch, that it was a public place. We went into the backyard. We wanted to find out what stage the investigation was at. But the police commander from Volsk turned his back on us and chewed out Lyudmila,” recounts pensioner Lydia Nikolayevna, a former schoolteacher. “I said to him, ‘You’re treating people with disrespect, turn around and face us. He wouldn’t tell us his name. He only ordered the cameraman to film everyone who opened their mouths and told the other officers to write down people’s license plate numbers,” says pensioner Nadezhda Ivanovna, a former college employee. People dispersed after village council head Vyacheslav Mokhov promised he would go with the dead man’s relatives to meet with the district police chief. The next day, five Tersans went to Volsk. “We were allowed to enter the police building in twos. Alexander’s daughter and the village head went in, then Alexander’s friends. I wanted to go last. But the police said to me, ‘No, that’s enough,'” says Valentina Vasilyevna. “We told them what evidence had been seen at the accident site. But the police weren’t really interested. They kept asking whether the village council had authorized the protest rally, and why the shop owners had agreed to let us in,” Viktor Konstantinovich recounts. The police returned to the village a day later. “They made the rounds of the houses yesterday and the day before yesterday. It was our village beat cop and some officers from Volsk. They knocked on the doors of old women at eleven, eleven-thirty at night. They told people to come outside, shoved papers in their faces, and told them to sign them. They told my wife that by six in the morning they had to get the signatures of the people who had gone to the meeting,” say Viktor Konstantinovich. He nervously twirls a phone in his hands. “Dont mention my surname in the newspaper,” he adds. “He didn’t even get out of the car. I asked where he’d got my name and address. That stopped him short,” recounts Nadezhda Ivanovna. The village beat cop served Lopeystskaya with a notice of initiation of administrative proceedings under Article 20.2 of the Administrative Offenses Code (“Violation of the Rules for Holding a Public Event”), as filed “against an unknown person,” along with an official warning from the Interior Ministry’s district office. The warning was followed by list of six articles from the Administrative Offenses Code and Criminal Code, including the article that stipulates “organization of an extremist community” as a felony. The neighborhood police precinct is in the village council building. It is quiet and hot in the hallway, and flies are buzzing. The beat cop’s office hours are glued to a window: two hours on Tuesdays and Saturdays, one hour on Fridays. I call the mobile phone listed there. “There was an unauthorized protest rally on my beat, ninety-seven people. I’ve been ordered to gather evidence,” says Lieutenant Alexander Bakanov. Lieutenant Bakanov does not specify who gave the orders and why. He cuts the conversation short. The door to the office of village council head Vyacheslav Mokhov is open. 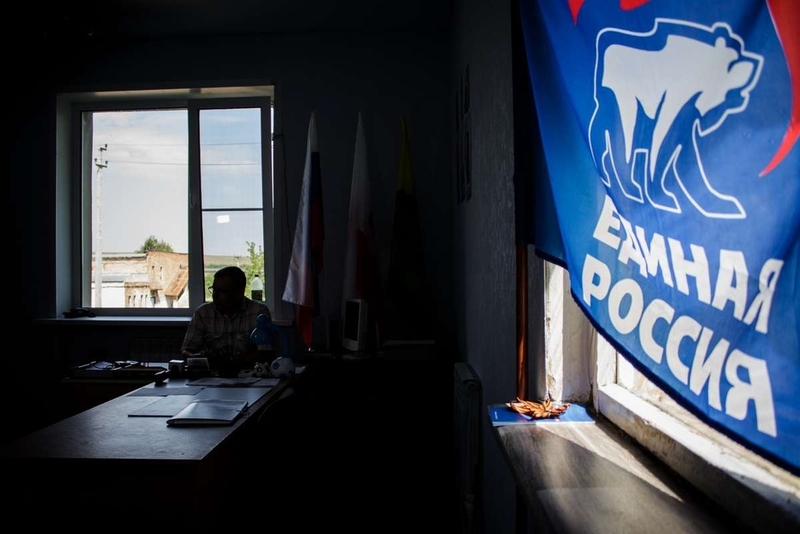 A blue United Russia party flag covers a crack in a window. There are framed photos of the president, the region’s governor, and the district head on the wall. The Volsk coat of arms features a sleeping bear. The ladies in the office next door chime in unison that the boss has left the village. Pointing at each other, they argue about who should replace Mokhov when he is out of the office. Mokhov hangs up on me twice, but then he arrives at the office anyway. “Don’t you photograph me. I’m scared of everything. This thing can be spun the wrong way,” he says. “That was the first unauthorized protest rally in the Volsk District ever,” he adds, lowering his voice. P.S. The press’s attention to this story has been reflected in the surprising speed with which local law enforcement has reacted. While this issue was going to press, a criminal case was opened under Criminal Code Article 264 (“Violation of Traffic Rules”), and the Volsk District Court placed Alexander Letov under house arrest. Volsk District Deputy Prosecutor Andrei Shevchenko refused to comment on the case when asked by Novaya Gazeta. Meanwhile, the Volsk District Court has begun hearing the matter of Lyudmila Lopasteyskaya’s alleged violation of Article 20.2 of the Administrative Offenses Code. The Tersans summoned to testify have told the court that what happened was not a protest rally, but a meeting of villagers concerned about the tragedy. The next court hearing in the case has been scheduled for August 9. You never know what scam will be visited on your weary head when you buy a cartoon of eggs from the Dixie supermarket. When the country’s reigning tyrant instituted reverse sanctions against the infidels of the west in 2015, all imported dairy products, eggs, and lots of other produce disappeared from the shelves, prompting a shameless wave of newly hatched brands made to look as if they had been produced in Finland and other straunge strondes. I happened upon a sterling specimen the other day, again after buying eggs at the Dixie in our neighbourhood. I opened the carton to find this message from the producers. Sounds nifty, eh? It gets better when turn the little slip of paper over. A farmboy myself, I have no wish to malign my brother and sister Russian farmers. So, I should point out that the three Oksky Eggs left in our fridge are indeed stamped as advertised. The rubber hits the road, however, when you take a gander at the poultry farm’s slick website, where you are treated to this tear-jerking video about the happy lives led by the chooks at Oksky Poultry Farm. It’s a veritable vision of the good life, isn’t it? The kicker, however, is that you will find these half-hearted attempts at instituting customer friendliness and gesturing in the direction of best (western) practices all over corporate Russia these days. Of course, you are more likely to find real friendliness and good quality in a mom-and-pop Uzbek dive or even a hipster coffeehouse, but oddly enough the impulse to do things better and shed the shabbiness and sheer meanness of the “Soviet consumerist hell” (Joseph Brodsky’s phrase) actually shapes the behavior of the mostly younger and early middle-aged people working in places like banks and certain government offices as well. The other day, I closed my Facebook accounts and pages, I hope for good. Part of the reason I closed them was that a New York City writer whose books and opinions I admire greatly, and who has a huge following on Facebook, wrote a mean-spirited and divisive post on Facebook condemning “the Heartland,” meaning the middle part of the United States. She labeled the place “heartless” and “dangerous” on the basis of her cursory perusal of an “interactive” map of the 2016 US presidential election results, published in the New York Times. While the map she cited is certainly worth studying and full of surprises, I imagine the writer saw only red, literally and figuratively, and blew a fuse. I doubted out loud, in the comments, whether the writer knew much about the “heartless, dangerous” Heartland. On the contrary, I know a great deal about it, since I was born and grew up there. She did not respond to my petty, eminently ignorable objections nor did most of her thousands of self-satisfied, bien-pensant followers, certain that the “heartless, dangerous” (and completely imaginary) “Heartland” had irrevocably damaged their beautiful souls and beautiful lives in Clintonia. But as reporter Issie Lapowsky and map expert Ken Field argue in an article published on July 26 by WIRED (“Is the US Leaning Red or Blue? It All Depends on Your Map”), there are maps, and then there are maps. For example, there is this map, devised by Mr. Field. To Field, there’s no such thing as a totally comprehensive map, but he says, “Some are more truthful than others.” The so-called dasymetric dot density map is one of them. The term “dasymetric” refers to a map that accounts for population density in a given area. Instead of filling an entire state or county with the color red or blue to indicate which party won, Field uses red and blue dots to represent every vote that was cast. On this particular map from 2016, there are roughly 135 million dots. Then, rather than distributing the dots evenly around a county, he distributes them proportionally according to where people actually live, based on the US government’s National Land Cover Database. That’s to avoid placing lots of dots in, say, the middle of a forest, and to account for dense population in cities. Taken together, Field says, these methods offer a far more detailed illustration of voter turnout than, say, the map in Yingst’s tweet. That map uses different shades of red and blue to indicate whether candidates won by a wide or slim margin. But by completely coloring in all the counties, it gives counties where only a few hundred votes were cast the same visual weight as counties where hundreds of thousands of votes were cast. So, the map looks red. But on the dasymetric dot density map, it’s the blue that stands out, conveying the difference between the popular vote, which Clinton won, and the electoral college vote, which Trump won. Why do I bring this sad business up on a website dealing with “news and views from the other Russias”? Over the last several years, I have been fighting a similarly invidious myth about Russia and Russians. To wit, Vladimir Putin is incredibly popular, as conclusively shown, allegedly, by dicey “public opinion polls” and rigged elections, and his “base” is in the “Russian heartlands,” which are, apparently, just as “heartless” and “dangerous” and stupid as the US “Heartland,” and similarly prone to throw their electoral weight behind a tyrant, unlike, we are meant to imagine, the smart sets in Russia’s two capitals, Moscow and Petersburg. I have been at great pains to show a discursive apparatus I have dubbed the “pollocracy” produces the results that both Putin’s quasi-fascist supporters and faux-liberal detractors need to cling to their respective security blankets. In the case of the so-called liberals, the security blanket consists in the notion that the world’s largest country is largely inhabited by woefully ignorant yahoos who have laid waste to any chance at building a democracy in the Motherland. As viewed by their opponents, the fake “patriots” in Putin’s camp, the same heartland yahoos are the country’s “pious,” “conservative” core and the source of the Putin’s ruling elite’s self-produced mandate to rule the country till kingdom come and particularly badly. Seventy percent of why I do this website is to show that Russia actually consists of lots of other Russians and lots of other Russias that belie the dodgy “findings” of pollsters and the lazy clichés reproduced ad nauseam by Russian and international reporters, “Russia experts” (nearly all of them resident somewhere other than Russia), politicos, and spin doctors to prove a self-serving conclusion they arrived at long ago without bothering to find out whether it was true or not. It’s not true. Just as it is emphatically not true the US “Heartland” is “heartless” and “dangerous.” Or maybe it and its mythical Russian counterpart, the “Russian heartlands,” are heartless and dangerous part of the time, but not all of the time and everywhere and on the part of every single woman, child, man, dog, and cat who live there. Nor, vice versa, are the alleged oases of high intellect and liberalism where pollsters, reporters, and opinion leaders (such as the well-known New York writer who, railing and trembling like the Prophet Jeremiah, condemned the place where I was born and grew up to the fires of hell) congregate, cities like New York, Los Angeles, Moscow, and Petersburg, utterly free of meanness, menace, vice, crime, bad governance, popular indifference, ignorance, and support for tyrants. What does this have to do with abandoning Facebook? First, I spent an inordinate amount of time trying to produce a quasi blog there that would complement and promote this website. Since I am nobody, however, more or less nobody was interested in what I wrote. They did, however, hang on every word written by people like the New York writer, who, having achieved a modicum of fame, felt no compunction about compounding a rank prejudice about a huge part of her own country and all the people who live there. So, I have found Facebook an incredibly dispiriting place to try get out my word, a word very few of my so-called friends, real and virtual, wanted to hear, much more wanted to share and spread with their own friends. Second, the continuing crackdown on bloggers and social media users in Russia has meant that fewer and fewer Russians are willing to write anything interesting on Facebook and its Russian ripoff, VK. Judging by my own real friends, more and more of them have either been observing total radio silence or retreating into the little cubbyholes known as Telegram channels, where they are invisible and inaudible to all the world except their own clique. Since one important feature on this website has been translations of the pithy, thought-provoking things Russian activists and just plain Russians have posted publicly on Facebook and other social media, I was left staring at a once-overflowing well going drier by the minute. Third, WordPress gives its bloggers some crude but decent tools to see where their readers are finding out about their blogs and blog posts. Over the last two years, as my readership here as continued to climb, the share of those readers who were turned onto my website or particular posts through Facebook has shrunk, meaning that my own friends, real and virtual, have been less likely to share my posts with their friends than complete strangers have been to look up Russia-related topics on the internet and find their way here. So, rather than continue to pine for support from actually hostile liberal and leftist opinion leaders whose only interest in my Facebook posts and blog posts was to scavenge them for news and ideas they would instantly pass off as their own thoughts and finds without crediting me, I have decided to live without them in order to more fully embrace you, my anonymous, ever more numerous, faithful readers. This week Idavang Group will begin construction of a pig farm in Leningrad Region with a ₽3.7 billion price tag. The new facility will help the company increase pork production by thirty percent. The new facility is designed to accommodate 55,000 pigs at any one time and produce 12,000 tons of pork live weight. The facility will include twenty-six hog houses, a feed production unit, a feed warehouse, and other buildings. Seven of the hog houses will be put into operation next years, and the facility will achieve its full capacity by 2024. The project’s overall price tag is ₽3.7 billion [approx. €50.3 million]. The payback period is fifteen years. As sources at Idavang Group explained to us, the project became possible after the Russian Agriculture Ministry approved a subsidy for paying interest on the loan the company planned to take to build the facility. The ₽1.6 billion loan was disbursed in April. Late last year, Idavang floated €85 million of priority secured bonds on European financial markets. Part of the proceeds from sales of the bonds could be used on building the facility, which will be in the Luga District. Idavang Group is a subsidiary of Idavang A/S, a Danish company that owns pig farms in Russia and Latvia. The company has a pig farm in Leningrad Region’s Tosno District that produces 20,000 tons of pork annually, as well as a farm in Pskov Region that produces 10,000 tons of pork per year. Market insiders say that circumstances are not favorable for expanding production. “We’ve been seeing a glut of pork on the market, and only the major companies, which have their own feed supply, have been doing well,” says Andrei Krylov, director general of Dawn Plus LLC. According to Mr. Krylov, players planning to expand expect they can oust small producers who do not have their feed production facilities from the market. For example, Pulkovo Agroholding, which does not have its own feed supply, has now filed for bankruptcy. “We have been stepping up the production of feed. We have 3,500 hectares in Oryol Region and 1,000 hectares in Kaluga Region where we grow grain. In addition, last year we launched a feed production facility in Kaluga Region,” Mr. Krylov adds. Other experts also say the market is glutted. Last year, Russia produced 3.3 million tons of pork. Domestic companies meet only 97% of the total demand for pork, says Lyubov Burdiyenko, an analyst at Emeat Information and Analysis Agency. According to Ms. Burdiyenko, pork prices began to rise in April after a decline at the beginning of the year. The price rise was due to the onset of the summer cottage and kebab cookout season. However, wholesale prices in April were ₽168 [approx. €2.30] a kilo on the half carcass. This is three percent lower than in April 2016. Producers have been operating on the verge of profitability, the analysts note. Translated by the Russian Reader. This post is dedicated to my father, a retired pig farmer, on the occasion of yesterday’s Father’s Day holiday. He taught me everything I know about pigs and farming, and many, many other things as well. Photo courtesy of Fermok.Ru.